Click to enlarge the engraving. This is an interpretation of an Orrery built by the Scottish Astronomer James Ferguson in 1750 for use in lectures about the solar system. Our goal is to recreate what you'd get if you dropped into an 18th century scientific instrument maker's shop in London and placed an order. Each Orrery is individually built from brass, precision ball bearings, and sustainably harvested Honduran Mahogany using a blend of 18th century handwork and 21st century CNC automation - no two are exactly alike. The base is about 10" in diameter and the mechanism is about 4" high. Each Orrery comes with a 40 page booklet explaining the Orrery in detail, the history of the mechanism and its inventor James Ferguson, and a few pictures from the workshop. 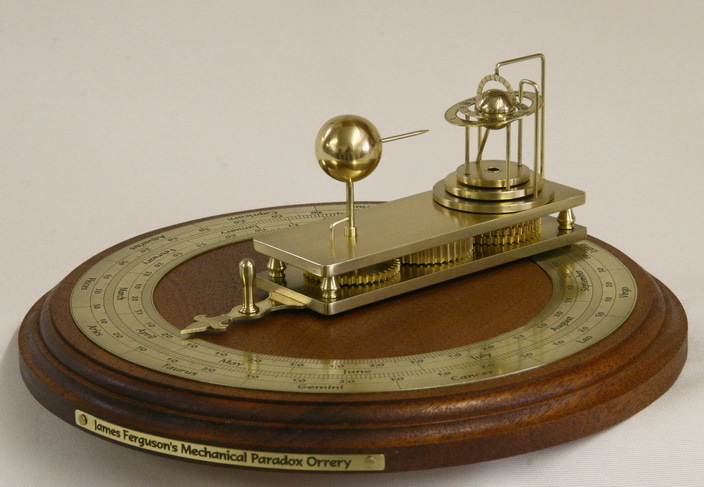 The Orrery is not just decorative - this is a valuable teaching instrument. You can follow in Ferguson's footsteps by showing people how the Earth maintains its orientation as it orbits the Sun, why seasons happen and summer and winter are reversed between hemispheres. 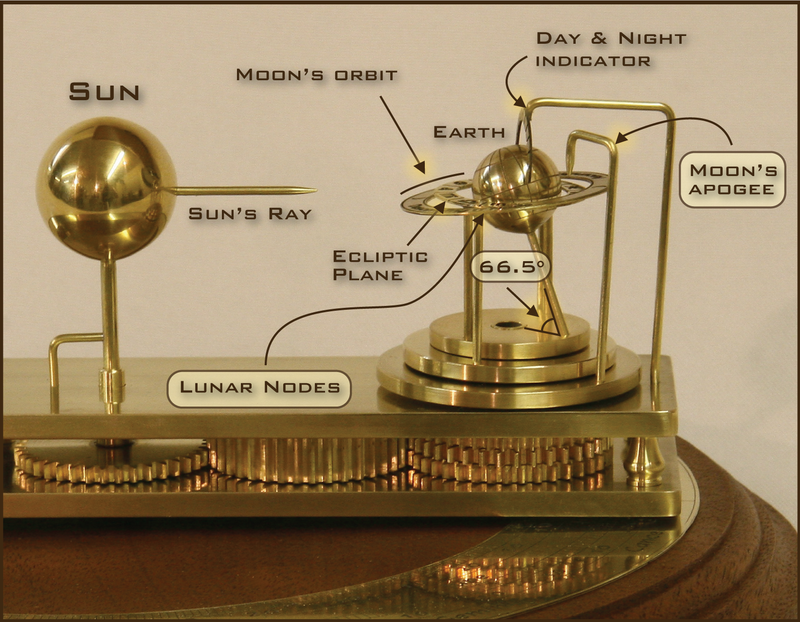 The Orrery illustrates how eclipses can happen when the nodes of the Moon's orbit intersect light coming from the Sun, and how the nodes and apogee of the Moon's orbit move over time. Today's modern technologies have not replaced people's basic curiosity about the Earth and Moon. The Orrery is visually fascinating and can be used to facilitate talks to astronomy groups, Boy and Girl Scout troops, science classes, and more. You'll be amazed at the conversations stimulated by the Orrery. The differential motions of the Earth, nodes, and apogee are fascinating to mechanically inclined people even if they're not astronomy buffs. The term "Orrery" is a bit of a misnomer - the word "Tellurian" is a better term for a teaching device focused on the Sun, Earth, and Moon. We use the term Orrery here to be faithful to Ferguson's writings. Illustration by Lindsey Whittemore This Orrery is unusual because it illustrates the movement of the nodes and apogee of the Moon's orbit, instead of the Moon's position. The Moon's orbit is elliptical, with an eccentricity of about 5.49%. The difference in the perceived size of the Moon between the perigee (the closest approach to the Earth) and apogee (the farthest point from the Earth) is about 14%. The distance to the Moon is about 50,000Km closer at perigee than at apogee. People noticed the difference over the years because the Moon is about 30% brighter when closer to the Earth. When the Moon is near the apogee its slightly smaller size leads to an annualar eclipse, when we see a ring of sunlight all around the Moon. The moonrise on May 5 2012 coincided with the Moon being at perigee, sometimes called a "super moon" A recent annualar eclipse (descending node) was May 10, 2013. The precession of the apogee around the Earth is just less than nine years. The pointer fixed to the large bottom plate represents the position of the apogee of the Moon's orbit. The Moon’s orbit is inclined 5.14° from the plane of the ecliptic (the plane of the Earth’s orbit around the Sun). The points where the Moon’s orbit intersects the ecliptic are called the nodes. The conditions for an eclipse require that a node intersect the line of light from the Sun to the Earth and that the Moon be present at the node at the same time. These nodes recess around the Earth with a period of about 18-1/2 years. The sloped ring on the orrery represents the Moon’s orbit. The Earth’s axis is inclined 23.5° with respect to the ecliptic and remains fixed in that orientation with respect to the zodiac. The Orrery illustrates this with a zodiac inscribed on the ring representing the plane of the ecliptic. The day/ night indicator mounted to the frame facilitates conversations about the seasons and different lengths of days and nights throughout the year. Ferguson's original model does not survive, but there is much information about it in Ferguson's writings. The Science Museum in London does have a related instrument by Ferguson which works with rope and pulleys instead of gears. "Three wheels on the same axis mesh with one thick wheel. Turn the thick wheel. One of the thin wheels goes forward, one backwards, and one goes no way at all!" What Ferguson was really doing with his Mechanical Paradox was emphasizing the importance of defining “rotation” with respect to a fixed frame of reference. The “paradox” arises when in a train of gears – A, B, and C – gear A is fixed and gears B and C have epicyclic motion around it. Gear A is the gear under the sun and is fixed to the base. When all three gears have the same number of teeth, gear B rotates twice for each rotation and gear C maintains its orientation to a fixed frame of reference. That keeps the Earth’s axis pointed in the same direction. When gear C has fewer teeth than gears A and B, it turns in the direction opposite the mechanism, in this case illustrating the regression of the nodes. When gear C has a few more teeth, it will slowly turn in the same direction as that of the mechanism, illustrating the advancement of the apogee of the Moon’s orbit. James Ferguson (1710-1776) was the self-educated son of a Scottish crofter. At age seven he learned to read by listening to his father teach his elder brother to read the catechism. He developed an early aptitude for mechanics. The story is told of young Ferguson’s fascination with mechanics being inspired by watching his father use a large lever to adjust the roofline of their house. By the age of ten, he was studying the stars while tending sheep and making models of spinning wheels and mills. He later built a wooden clock and a watch with whalebone springs. His education was enhanced by several servant positions with people who recognized his talents and contributed to his interests. One of his servant positions was with a neighbor who engaged him to clean clocks. Moving to Edinburgh in 1734, Ferguson began to support himself as a limner (painting miniatures). He moved to Inverness, where he published his Astronomical Rotula for showing the motions of the planets, places of the Sun and Moon, etc. (The Rotula is similar to an ephemeris, but uses circular rotating volvelles.) He built his first orrery in 1742, and then made his final move to London in 1743. By 1748 Ferguson began to give lectures on scientific subjects, and his apparatus facilitated these lectures significantly. In 1763 Ferguson became a Fellow of the Royal Society of London. Ferguson’s famous Select Mechanical Exercises, with a Short Account of the Life of the Author was published in 1773. Besides being one of the first popularisers of science, his influence extended considerably, with Thomas Paine and William Herschel reportedly studying his books. George III, while Prince of Wales, attended Ferguson’s lectures and rewarded him with an annual pension of £50 from the Privy Purse until his death in 1776. He designed orreries and a number of clocks. He knew Benjamin Franklin and apparently was inspired by Franklin's famous 3-wheeled clock, later designing his own versions. Ferguson was a very prolific inventor, making many devices for use in research and lecture demonstrations. Armstrong Metalcrafts is building a limited number of these for sale. The price is $995. To inquire about a purchase, please use our contact form or send an email to "sales" at armstrongmetalcrafts.com. These books have the best descriptions for this orrery. You can find links for these in Armstrong Metalcrafts Bookstore. Buick, Tony. Orrery 2014; New York, Springer. King, Henry C. Geared to the Stars. 1978; Toronto, University of Toronto Press. Millburn, John R. 1988. Wheelwright of the Heavens. 1988; London, Vade-Mecum Press.